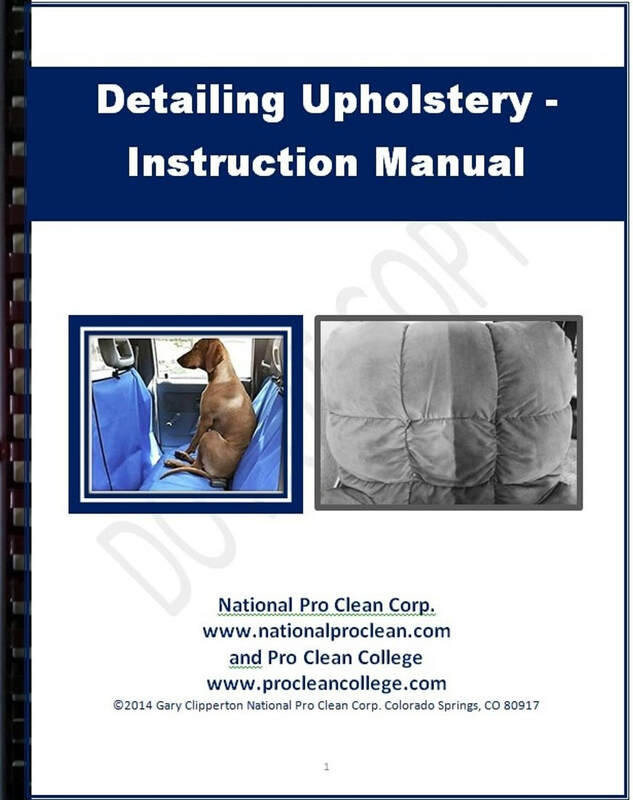 Carpet Care Management, Marketing and Technical Training Bundle. 70 Mistakes Carpet Cleaners Make ... and how to avoid them! Just released – a new two-part Video Series. Learn how to master all the professional techniques that can take you, or you workers cleaning skills to the next level. 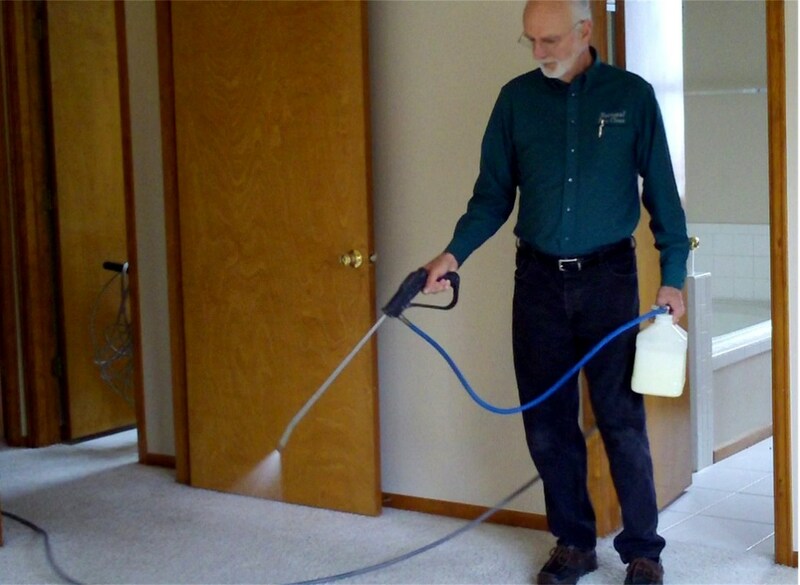 If you have a carpet cleaning business, then mastering these techniques will definitely help you build clientele. If you have helpers who work for you, make sure they are not always creating costly mistakes. 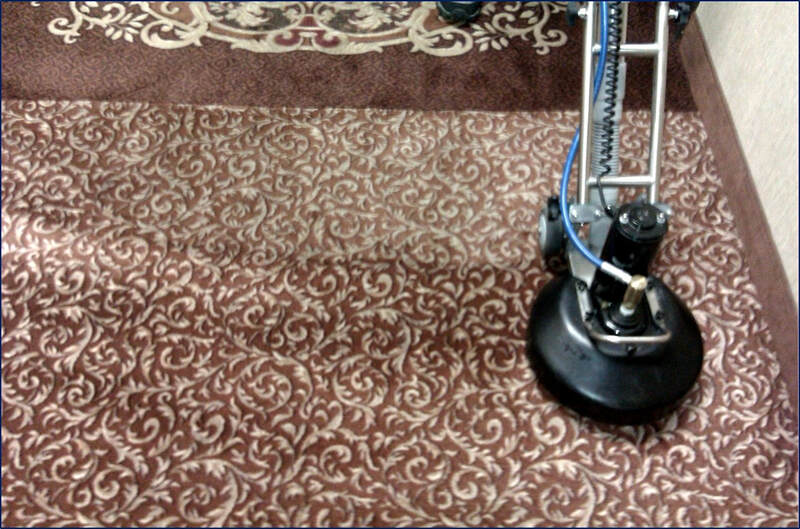 If you clean carpet as an employee, you need to ensure that your boss is impressed with your cleaning skills. Either way, this exclusive program developed from over 40-years of my personal experience will place you above others who learned by trial and error. Mistakes are expensive. Often they bring your credibility into question, and can get you replaced by others who are more skilled. 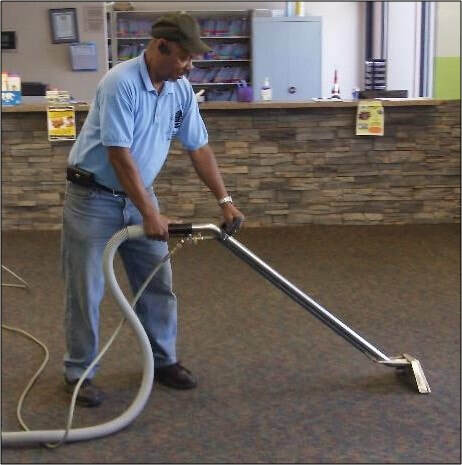 IICRC approved Basic Skills Carpet Cleaning program including IICRC diploma. Package contains 100-page manual and two slide shows. 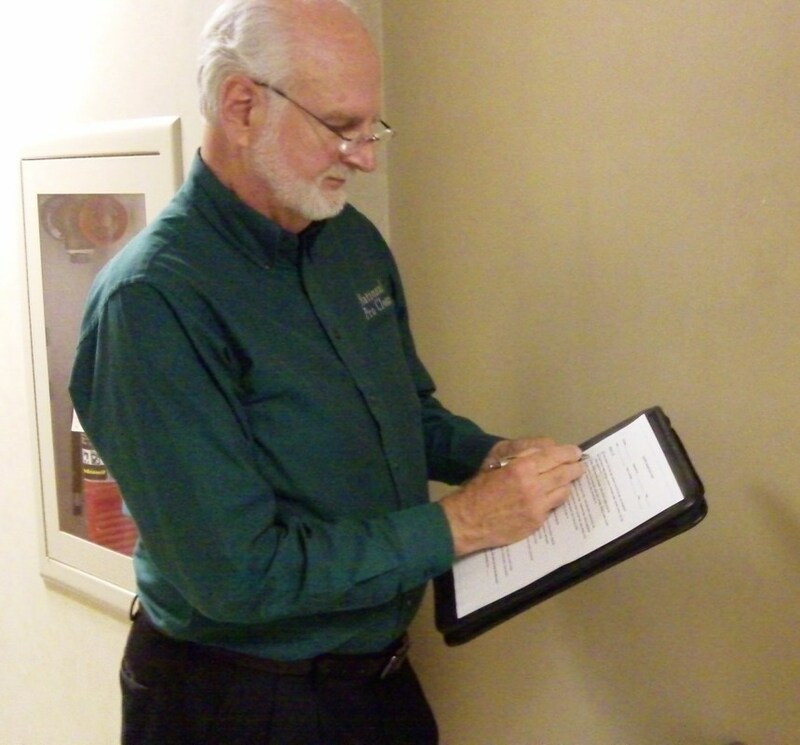 Learn and teach the diagnostic and troubleshooting guidelines that will curtail operator error. Student versions of the IICRC program are also available without the slide shows and videos. Ideal for classroom training with several students. 250 power packed pages on marketing, bidding, administration and comprehensive training to grow your business. 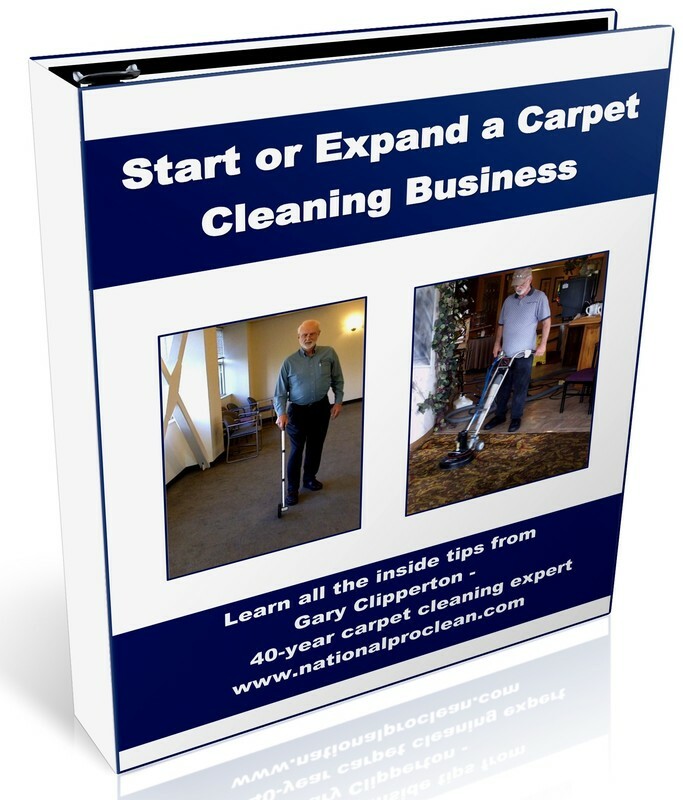 Learn all the inside tips on starting or growing a successful carpet cleaning business. A unique series of 40 spreadsheets that help you run your entire cleaning business. Shows how to import a free business database for any zip code to use for direct mail, telemarketing or canvassing. Helps with startup cost projections, tracking the effectiveness of all marketing strategies, and complete follow-up plans. Provides work orders, invoices, scheduling, supply tracking, payroll, taxes, budgets, account retention strategies, KPI, P&L reports and self-rating evaluation of all management duties. Master the understanding of soil composition, the fundamentals of cleaning, maintaining indoor air quality, pH adjustments and working with stain delamination. 9 topics with tips regarding selection and use of supplies and equipment. 11 topics about successful spot removal procedures. 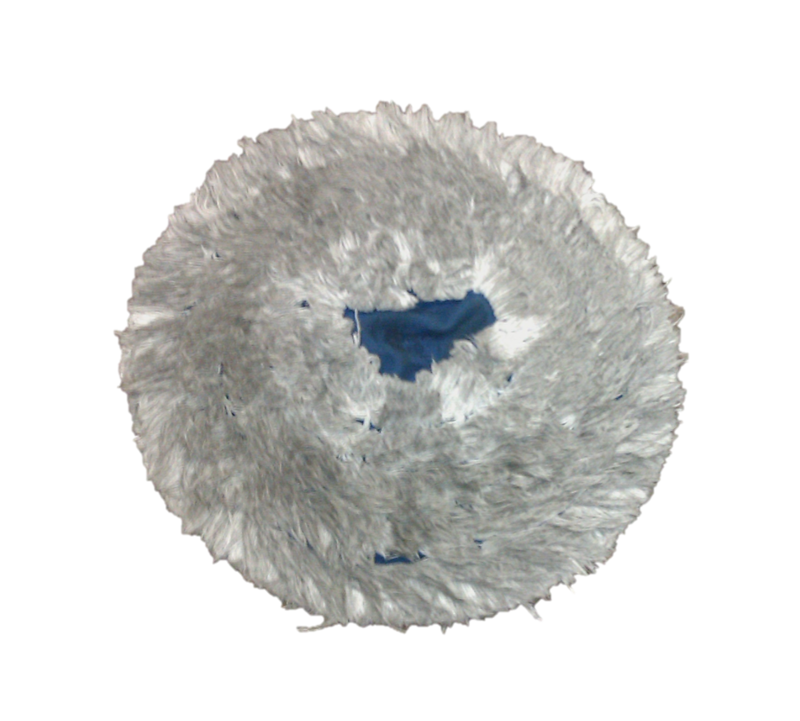 Tips on deodorizing, drying, protectants and diagnostic checks for hot water extractors. 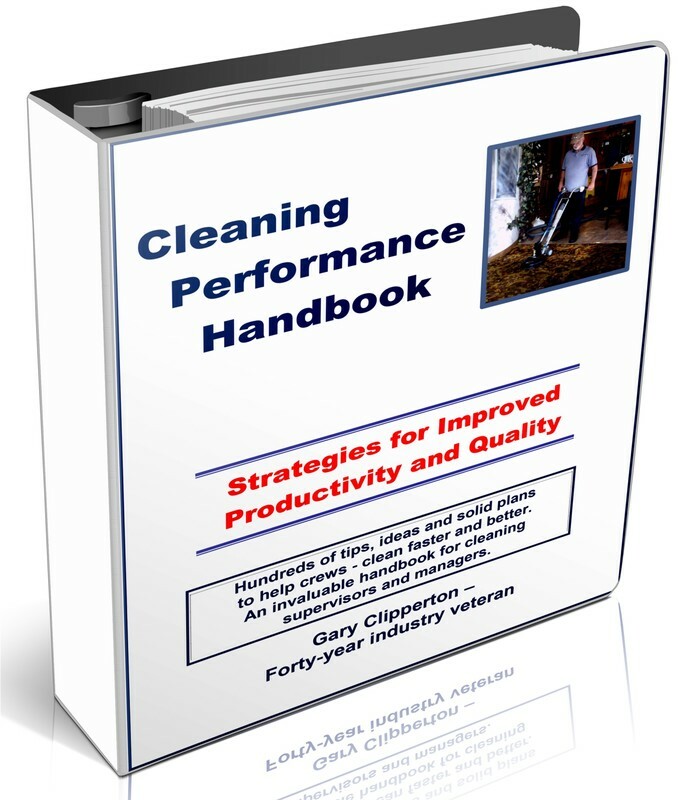 250-power packed pages of how to best train and motivate cleaning workers. Contains over 35 strategies and programs to implement new skills and improve quality. Innovative In-Service training lessons. Forty-five ways to supercharge your training program. 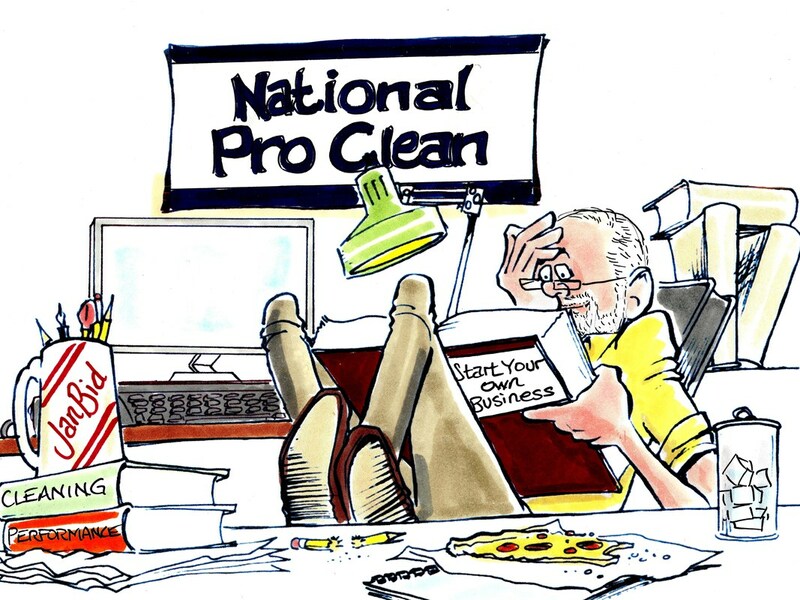 Twenty-eight strategies to improve cleaning productivity. 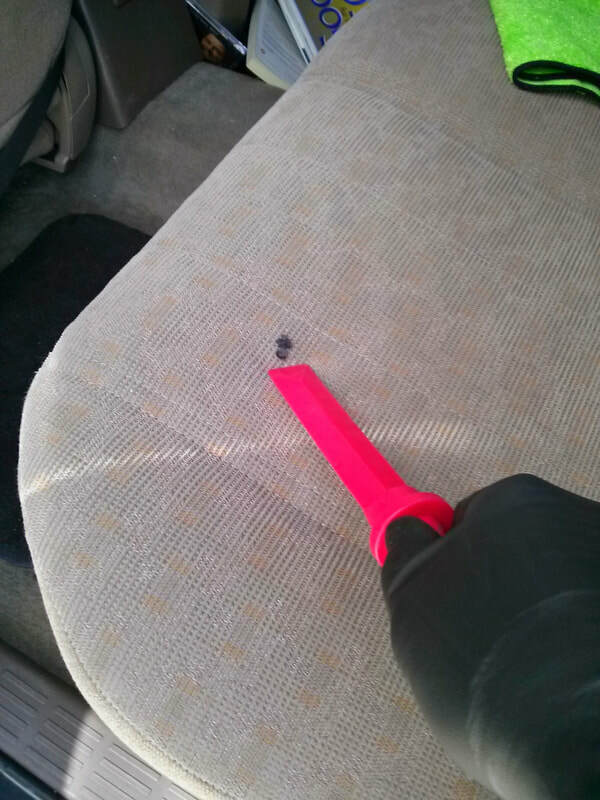 Over 120 tips on solving difficult cleaning problems. Over 30 strategies to solve performance problems. Ten mistakes to avoid in cleaning carpet. Ten mistakes to avoid in stripping and finishing floors. Twenty-seven coaching skills that boost team performance. 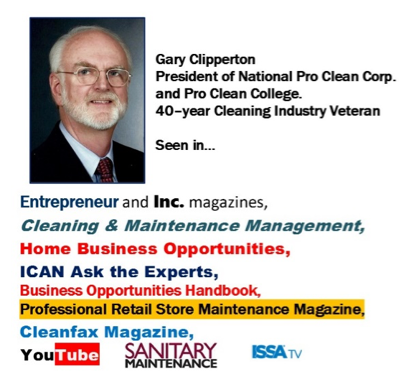 This exclusive video program will help you on your way to becoming an expert in carpet cleaning. Don’t overlook wrinkling problems. Learn the causes and the outcomes. 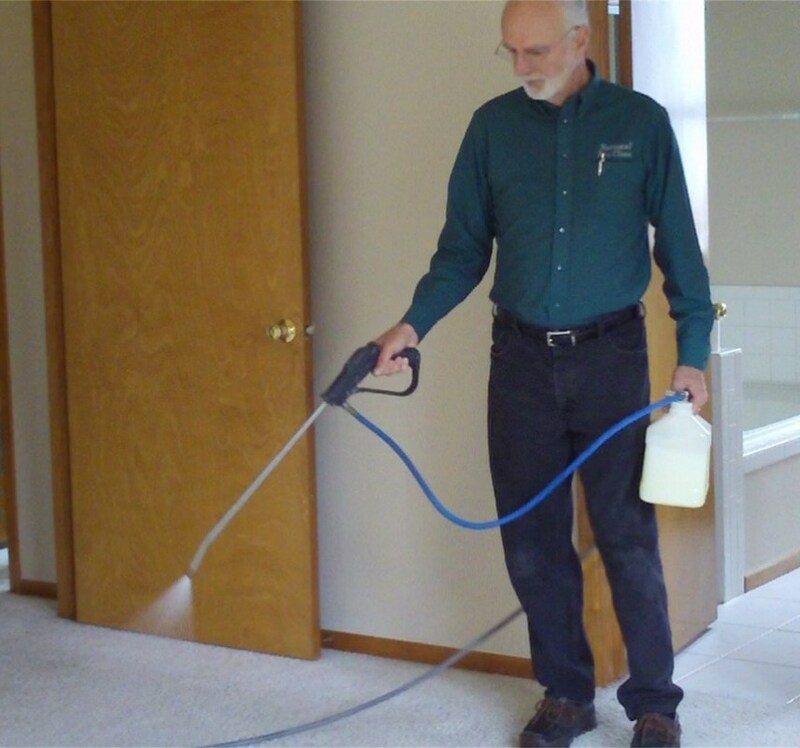 In total, you will learn how to prevent or correct 70 mistakes that carpet cleaners make. These are all critical mistakes that can ruin any job. This series will fully train all workers. Or, if you are working for someone else, this program will help accelerate your cleaning skills. If you own a carpet business, make sure your competition doesn’t get a head start on landing new accounts. Especially when difficult carpet is not cleaned to the customer’s satisfaction. Master the steps to make carpet look almost new - when possible. If you want to take your operations to the next level, you need to invest in this training today. Your choice: eversion downloaded to your computer where you can make your own backups and print out the manuals, or you can order the download version plus the hardcopies mailed to you. You will be impressed with these videos containing priceless training skills. 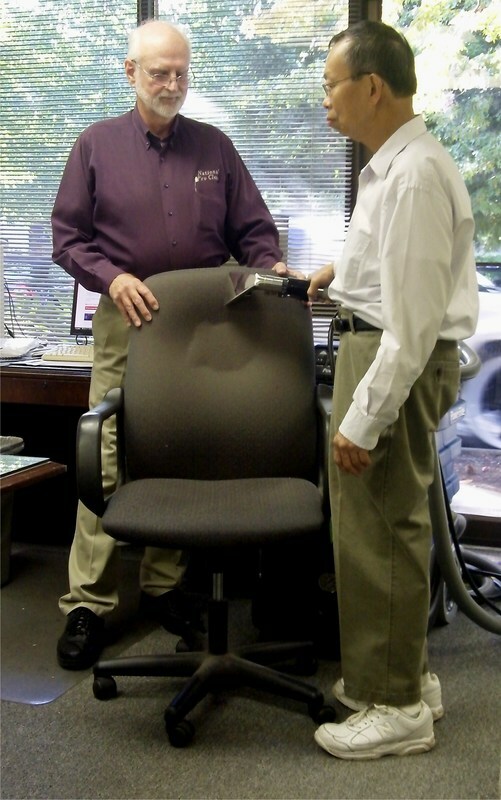 Two modules 1 1/2 hours each: Carpet Maintenance Theory and Carpet Cleaning Diagnostics Note: a third, personalized module is available at an additional cost to include photos of your facility, equipment, chemicals, procedures and staff. 1. Simply purchase, download, and study the program, including the 100-page instruction manual and two slide presentations. 2. When finished, complete the test found in the back of the manual. Email the answers to us and we will grade it and email a diploma to each student who passes. Students are allowed to re-test should they initially fail the test. 3. The first diploma is free and customers can purchase additional diplomas for as many employees as desired for $25 each. Successful completion of the test is required for each diploma. Student manuals can be purchased for classroom training. 2. Are You Ready to Build Your Own Business? 3. Should I Purchase a Franchise? 3. Identify Your Market – Who Are Your Best Customers? Contains a basic check list to help you start a new business. It helps you organize the activities and tasks that must be accomplished to get your business up and running. This worksheet becomes your master To-Do list. 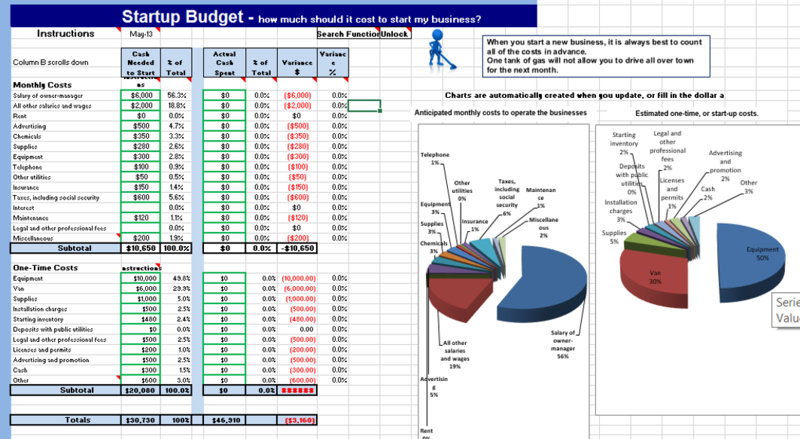 This spreadsheet helps you project your start-up costs. It also shows a pie chart to visualize your expenses. 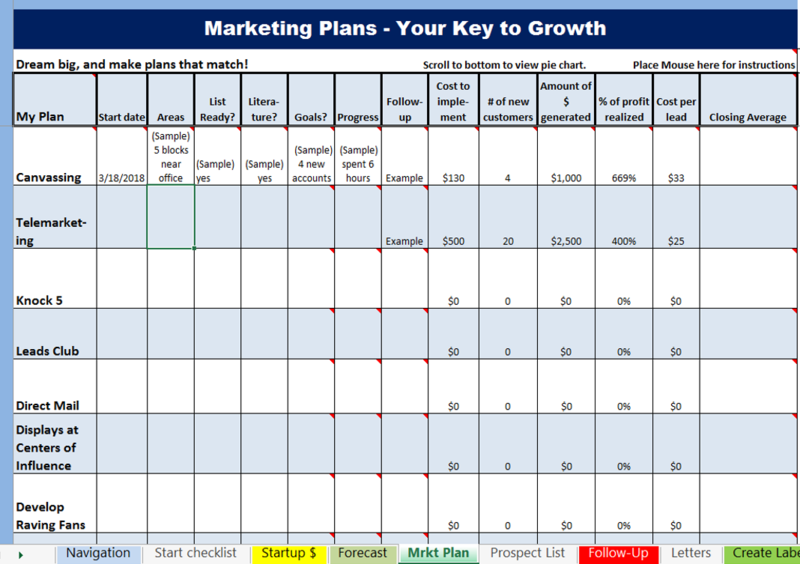 The Marketing Plan helps you create and track detailed plans to expand your revenues by adding more customers. The Prospects spreadsheet allows you to import a data list found at most public libraries. This is especially helpful for direct mail and telemarketing to commercial accounts. The Customer Relationship Management Follow up allows you to copy leads from the Prospects page, to develop a comprehensive follow-up program. This page contains letters and email formats that can be copied and pasted into an email, or printed and mailed to your prospects. Instructions on how to set up your mailing lists so the labels will print directly from the worksheets. 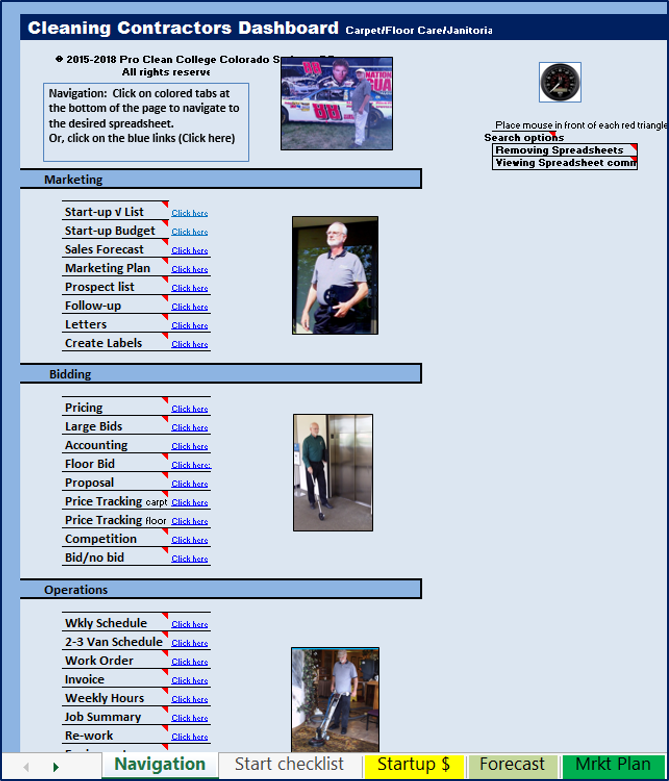 This page shows links to other websites that offer free CRM programs, or a free trial. A detailed spreadsheet that allows you to enter all of your business income and expenses to determine your current breakeven point. Then, you project your desired income to determine how much profit must be added to each job. Once you enter the desired gross billing rate, the spreadsheet will also show how much a square foot to charge. This pricing form can be taken to any job. It allows you to view and rate all the common difficulty variables that will affect the job time, and the production rate. 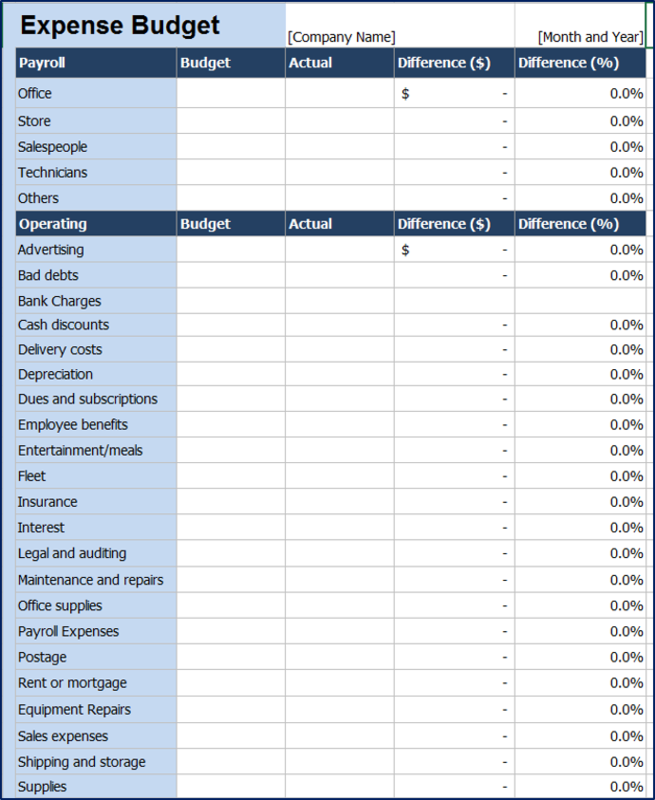 By determining your desired overhead and profit, and adding it to the total, the spreadsheet calculates the price per square foot to charge on each commercial job. This form allows you to enter the dimensions of each area for a large commercial facility. 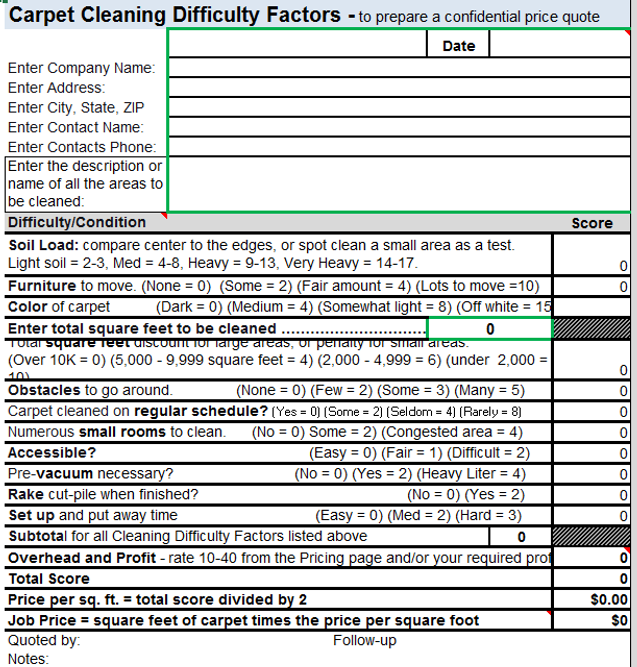 Then, you enter a Difficulty score and the spreadsheet prints out a detailed price list for you and the customer. A handy estimate or proposal form that can be used to quote jobs. This spreadsheet allows you to track all proposals from the $ Calc estimate sheet. Once you enter the job time, the spreadsheet shows your production rate and gross earnings per hour. 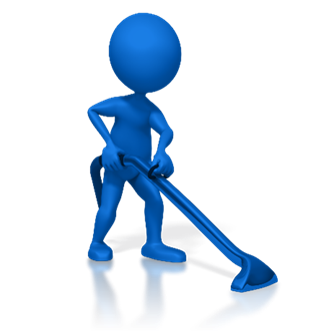 This page allows you to collect pricing information from other cleaning companies, and view the price comparisons. It becomes a great tool to evaluate the competition. A handy check list to help identify if you have the resources to handle an extra-large bid. 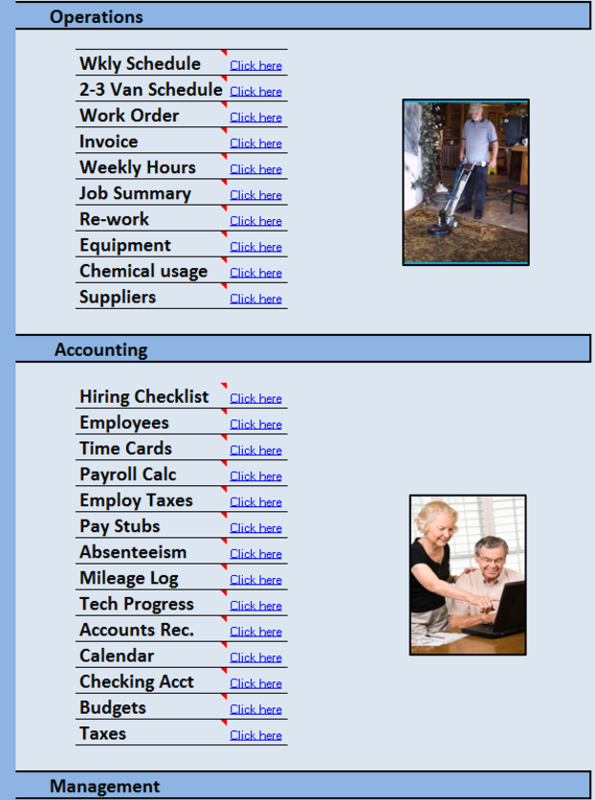 Allows you to enter the work schedule each week for all of your jobs. It tracks the jobs, the dollar amounts, job details, and links to a map. It also shows a graph of your weekly earnings compared to your goal for the week. Allows you to enter the work schedule for all jobs each week and for up to three vans. 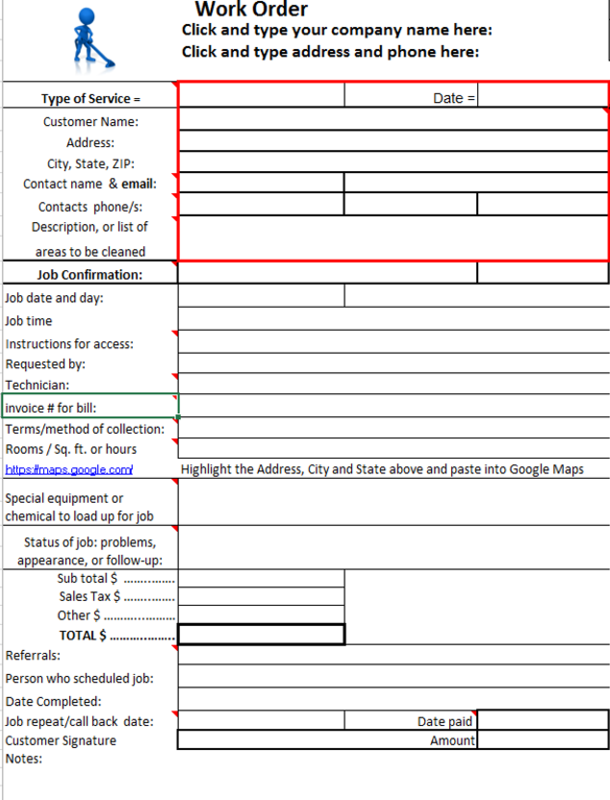 This form can serve as a job ticket for each job. It is best used to describe in detail, the exact job. It can be turned back in, to verify the work has been completed, and to serve as salary earnings that are due to the worker. Creates an Invoice that totals the job price, and can be mailed, or emailed to the customer to request payment. This spreadsheet allows you to create a master with your company info, and then duplicate it as many times as desired. You can automatically fill in the customer info with a copy and paste function, and also sort to locate any Invoice in the system. This spreadsheet allows you to enter the weekly hours for each worker. It automatically calculates how many hours for the week are projected per worker. Allows you to record job billing amounts, notes about each job, and track the follow-up date for call-backs. Allows you to record each phone call for re-works, problems, call-backs, or complaints. Track the reasons by worker, and resolve challenges to improve future results. Allows you to track all of your equipment including purchase date, vendor, current location, repairs, parts, replacement date and overall rating. 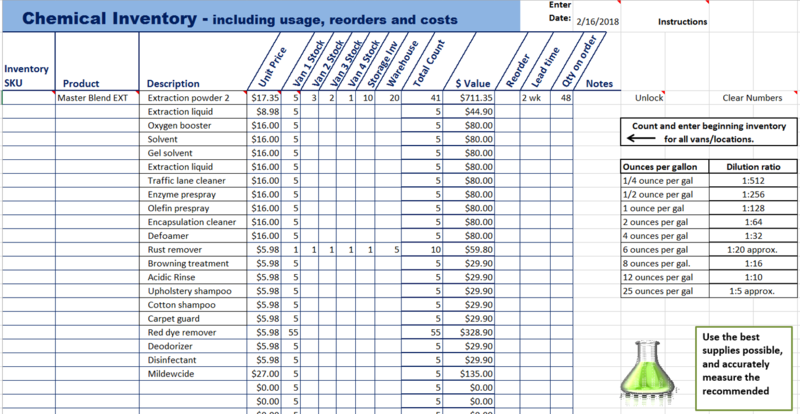 Keep track of all of your cleaning products to know how much you use each month, and the total cost. Keep accurate records of all suppliers or vendors where you purchase your equipment and chemicals. Tracks pricing and contact info. 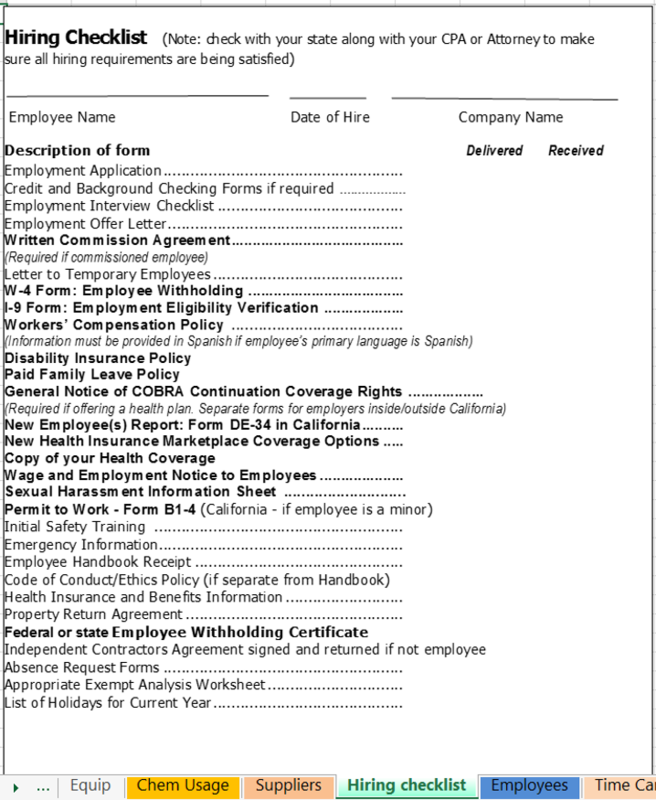 Helps keep track of all employees with the important information for each worker. These cards can be used for employees to record the hours they have worked each week. Calculates the gross and net pay for each employee. Calculates exact payroll deductions in each category for all employees. Displays employee payroll income and deductions to accompany paychecks. This chart records and tracks time-off for each worker. This form can be printed and used to track mileage for each company vehicle. Can be used to track the overall performance of each technician including up-sells that may qualify for addition commissions. Daily calendar to organize your work. Allows you to enter all of your deposits, checks and credit or debit card expenditures. The spreadsheet keeps track of your current checking account balance. Allows you to establish a budget amount for each expense category, and then enter the actual amount. The spreadsheet calculates the amount over or under. A list of 74 possible tax deductible expenses with links to the IRS details. 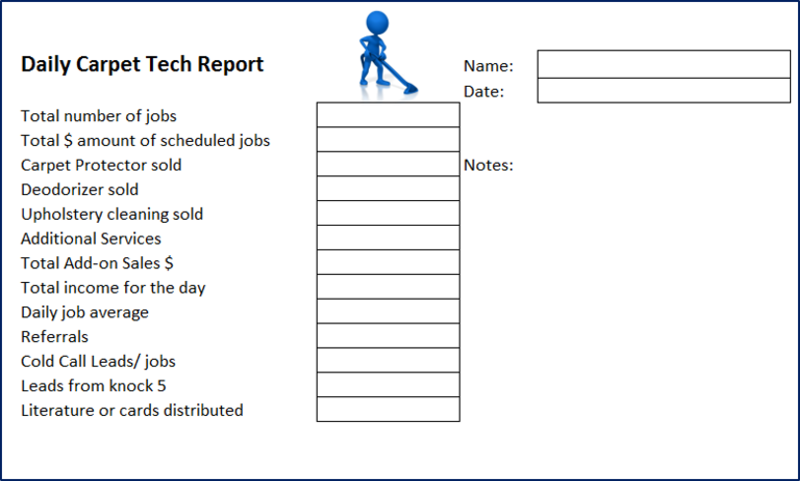 A handy worksheet to track company performance by listing Key Performance Indicators. 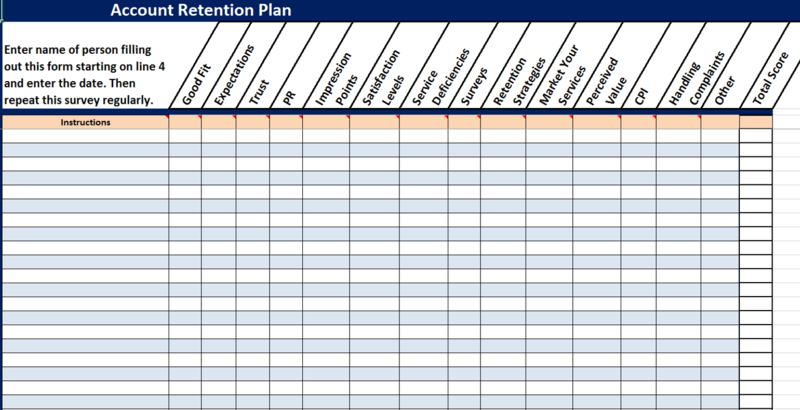 The Account Retention Plan spreadsheet shows 13 areas that must be considered, tracked, and improved to excel in account retention. The SWOT worksheet stands for: Strengths, Weaknesses, Opportunities and Threats. It allows you to evaluate your market and business plans to capitalize on your strengths and improve your weaknesses. Time spent analyzing your business, can ensure your continual growth. Profit and Loss or Income/Expense Statements are used to determine your level of profitability. It also provides data that shows any positive or negative trends. This spreadsheet allows you to evaluate and score 47 of management skills as they relate to building a successful business. This is a great tool to track your progress, or areas that need improvement, on your way to success. Was the problem with the chemical, the equipment, or the technician? Ten items to examine. Gap analysis – how far are we from achievable competence? Self-test: What kind of manager are you? Don't miss out on the scores of trade secrets you will master - all designed to take your income to the next level.